Caroline County is stationed on Maryland’s Eastern Shore bordering Delaware. As of 2010, its total population was 33,192. The Caroline County courthouse, located in the capital of Denton, was built in 1797. Other major towns include Federalsburg and Greensboro. Caroline County is fiercely rural (it has no interstate highway or U.S. highway), and is the population increases consists primarily of retirees and workers who commute to western Maryland. The registered Republicans and Democrats are almost evenly split, with 54 more Republicans. Approximately 78% of the population is White, 14% is Black, and 5.5% is Latino or Hispanic. 90% of the population comprises ages 25 to 44, and the median household income is about $39,000. Medical care in Caroline County is available from Denton’s Shore Health, part of the University of Maryland Medical System. Shore Health provides rehabilitation, diagnostic and family medical services. Residents must travel to one of the neighboring counties for most hospital services, however. Caroline County attorneys have the highest level of pro bono service than any other county7 in Maryland: a fully 61.5% of lawyers in Caroline performed 50 or more hours of pro bono service in 2012. 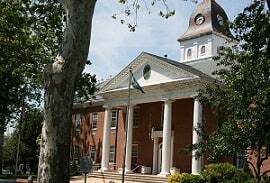 In 2015, Caroline County Circuit Court had seven automobile accident cases filed, and six other types of civil tort cases which would include medical malpractice, premises liability, and so forth. There were just three jury trials. How do these jurors value personal injury claims? It is fair to say that the county’s jurors have a reputation for being conservative. That is to be expected across the board on the Eastern Shore and Caroline County might be a little conservative even by Eastern Shore standards. The take home message if you are a lawyer with a case in Denton is clear. If you have a great case, push it forward. A good case is a good case anywhere. But if you have a claim based on questionable medicine or a client that the jury will not believe, your claim is not likely to go very far. There have been few reported verdicts in Caroline County in recent years. There was a defense verdict in a case against Ruxton Health Care back in 2010 and a $285,000 settlement filed in Caroline County in a case against the Kent County Sheriff and the Kent County Board of Education in 2011 for, of all things, an illegal strip search case. But not much otherwise. We have never heard of a medical malpractice plaintiff's verdict in Caroline County. It is just amazing how few personal injury cases go to trial in this jurisdiction. The best personal injury lawyers try to look for reasons to move the cases to another jurisdiction and are often successful. But, again and this cannot be stressed enough, for serious cases with permanent or extensive injuries, a plaintiff can be very successful in Caroline County. Jonathan G. Newell is the only judge in the Circuit Court in Caroline County. Judge Douglas Everngam is the sole judge of the District Court. The Maryland Court of Appeals announced that effective Monday, Oct. 2, 2017, Cecil County Administrative Judge Keith A. Baynes would serve as the Administrative Judge for the Second Judicial Circuit, which consists of Caroline, Cecil, Kent, Queen Anne’s, and Talbot counties. Our law firm handles serious personal injury car accident, product liability and medical malpractice cases in Princess Anne, Maryland (Somerset County). If you have been injured in an accident, by a defective product, or by malpractice in the Somerset County area, call our lawyers at 800-553-8082 or click here for a free initial consultation.